We stepped off the boat on the Mekong River and entered Thailand. More than any other Southeast Asian nation, Thailand, situated on the southern end of the Indochina peninsula, has written its own history. This is largely because it is the only country in this region never to have been colonized by Europeans. It acted as a buffer state between British India and French Indochina. Present-day Thai culture evolved from a melding of many disparate influences, most notably southward migration by people living in modern-day China, early Indian cultures and the massive, long-lasting Khmer Empire. After having occupied present-day Thailand for much of the 9th through 13th centuries, the Khmers fell in 1431. A smattering of states comprising Thais, Mongols, Chams, and other peoples thrived in the region. Several dynasties occupied the country over several centuries and in 1767 the Chakri Dynasty was established in the newly formed city of Bangkok. This dynasty continues to reign over Thailand through King Maha Vajiralongkorn, the only son of the world’s longest-serving head of state. King Bhumibol Adulyadej became king in 1946 and ruled through his death in late 2016. The monarchy is revered throughout the nation, though the nation’s working government has changed hands several times in recent years. Despite this conflicted governmental history, Thailand has experienced rapid economic growth over the past several decades and is now an economic power in the region. It has the third highest quality of life in Southeast Asia and holds a rich combination of jungle landscapes, modern cities and fascinating historical landmarks. Today the country is a constitutional monarchy much like England with a parliament and prime minister. We crossed the border along the Mekong and off to our left upstream was Thailand. Thailand after two days on the Mekong. Buddhist statue along the bank of the Mekong. Rice fields in the foreground. We were met at the dock by transportation that took us to immigration and customs. Now this became frightening. We were met by our guide for Thailand, and our main guide also accompanied us on the total tour. He is Vietnamese, and much to his and our surprise, he was not allowed to enter the country. There was confusion at immigration about his identity and he and we were both concerned he would have to go back to Vietnam and straighten out identification problems. This happened even though he had been in the country before many times. We waited patiently at immigration while all this took place and our Thai guide kept us posted. After a three hour wait, the problem was cleared up and we were on our way. People on the tour during this exercise were saying, “Without him, what are we going to do?” We did have our Thai guide and could have at least gotten to our hotel. This is the thrill of traveling in foreign lands. Next morning we came face to face with one of Thailand’s most storied creatures, and one of the world’s most revered animals: the elephant. Considered endangered in the wild, Thailand’s elephants face external threats from logging and poaching, as well as trainers intent on using the animals in circus-type shows. On our visit to the Chian Rai Elephant Sanctuary, we got to see these beautiful animals in their natural setting. A 40 acre swath of bamboo groves, forest, grassland, and swamp, the sanctuary provides the elephants with room to roam as they wish. We also had the opportunity to feed the elephants before enjoying a very fine Thai lunch at the Sanctuary. This big boy was being kept isolated from the rest of the elephants. He was in musth pronounced must, which is similar to when other animals go into breeding mode. During the musth period, testosterone levels increase as much as six times and the animal will become very aggressive. The Sanctuary kept him separated from the rest of the elephants so they would not be injured. One of the signs is the increased secretions that take place on each side of the head and are very pronounced. One of the younger elephants just out for a stroll. We did not go near them, but kept a decent distance. Pam feeding an elephant. They really went for the bananas and when our group approached the fence line, they moved in quickly for a hand out. Our group chowing down at lunch. We were told to be aware that Thai food is very hot, but during dinner the previous night and at lunch, it was far from hot. Lots of vegetables and fruits with small amounts of meats were served. After this powerful outing, we visited the contemporary Wat Rong Khun. Known to outsiders as the “White Temple” for its gleaming, intricately carved exterior celebrating Lord Buddha’s purity. Wat Rong Kuhn is not truly a temple at all. When local artist Chalermchai Kositpipat found the original temple in a state of disrepair, he purchased it and dedicated his life to rebuilding it into one of the most beautiful Buddhist shrines in the world. Delicate carvings along the entirety of the roof line give the impression of a building covered in tufted snow, but a closer inspection reveals dozens of finely sculpted dragons, elephants, and other figures. Inside, the images on the walls and ceilings combine traditional Buddhist and Hindu symbols with more modern pop culture icons who Kositpipat believes further the Buddha’s message. As with Antoni Gaudi’s famous Sagrada Familia church in Barcelona, Wat Rong Khun is expected to take many decades to fully complete, but travelers may enter at any time. That evening we visited the Chiang Rai night market and grabbed dinner on our own. Pamela and I are not roamers even though we have been world travelers, so we had dinner at the hotel and crashed. The entrance to the temple at a distance. Pictures were not allowed inside, and we had to take off our shoes. Inside it was simply beautiful. Shrines and small temples were everywhere on the grounds. The beauty of the grounds was magnificent. It is hard to see how fantastic the buildings are unless you are up close. The next morning after breakfast, we took a scenic drive along the narrow mountain roads to the Doi Tung Royal Vill and Gardens. This is the former home of the late king Bhumibol Adulyadej’s mother, who led efforts against deforestation and also the heroin trade in northern Thailand. Now part of a development project, Doi Tung hosts families from the surrounding hill tribe villages to stay and receive vocational, agricultural, and social training. After the training program is over, the families return to their villages and put their new skills to work at local farms. I want to make a side note about how we travel when on the opposite side of planet earth. We are a long way from home and the hotels the tour company puts us in all serve a combination of western and Asian style breakfasts. Breakfast is our big meal for the day, but we found that if we did that too much we would miss out on some excellent Asian cuisine at lunch and dinner. So we altered our method of operation to enjoy all the local meals. Per the recommendation of our guide, we were not to eat food from the street vendors. He advised that he could, but we should not. We toured the home and the grounds and enjoyed lunch together at a local restaurant. Late in the afternoon we transferred to the airport for the hour-long flight to Bangkok. Now for a tip if you travel to Chiang Rai. After 19 days of touring we were beginning to drag a little. Have you ever been really tired, but kept on going? That was Pam and I. We were told to make sure we empty, and I repeat empty, everything out of our pockets at the airport. I travel in cargo pants so I have a lot of pockets. Second, phones, kindles, and other electronic devices must be placed in a bin and x-rayed with your luggage. I set off the alarm not once, but every time before I got it right. Fortunately, the people in line when I was sent to the back, motioned for me to get in, and go through the process again. Finally success was achieved, and I passed through the security check. We woke up when the plane landed in Bangkok. Pictures are of the gardens at Doi Tung Royal Vill. We took several hundred pictures of the flowers as this was an immense garden. Other Asian countries we have traveled to all share the love of beautiful flowers, flower gardens, and gardens in general. Beautifully sculpted, it was inspiring to walk along the many paths and enjoy the solitude and beauty of the area. The next morning we set out to explore sprawling Bangkok in all its colorful, tumultuous, and modern splendor. Bangkok has 8.1 million people compared to New York which is about 8.5 million. It is forty times larger than Thailand’s next largest city and houses everything from multinational corporations to world-class health care centers. Bangkok is Thailand’s heart and soul, and has been described as “the most primate city on earth” (a description applied to cities that dominate their respective nations). We began our touring of the Bangkok Flower Market, a riot of multi colored blooms located in Bangkok’s Old City. Street vendor selling goodies. I would have liked to have tried it, but our guide said the food was not for us. Small eels for sale. I did not see much there to eat and maybe they raise them to a bigger size, then butcher them. The familiar ‘tuk tuk’ for transportation around the city. It is a hoot to ride. The next pictures are a mix of the flower shops we saw sprinkled with small restaurants and street vendors. If I ever go back, I am going to try the food from the street vendors. I believe the guide just did not want anyone to take a chance and get sick. This restaurant looked interesting, but again our guide said this was not for us. He seemed to have gotten awfully protective of us. This picture was posted because we are from Iowa, and that looks like good sweet corn. Back on the “tuk tuk” we rode to the Wat Pho Temple, home of the Reclining Buddha. Covered in gold leaf, the icon measures some 49 feet tall by 151 feet long. The Tuk Tuk. Our transportation around old Bangkok. The Reclining Buddha. This temple was packed with tourists along with the rest of the sites we visited. Wat Pho is also the home of Thailand’s largest collection of Buddha images, and the complex is also known for being the birthplace of traditional Thai massage. Next, we visited the nearby Grand Palace, an immense complex of ornate buildings and gardens spreading along the bank of Thailand’s main river, the Chao Phraya. The original palace was built in 1782 by King Buddha Yodfa Chulaloke, the first king of the Chakri Dynasty, after he moved the nation’s capital to Bangkok from Thonburi. This gives you an idea of how many people were at the temples and the palace grounds. I stood in line to get this picture. The guard was loving it. You cannot see his face but there was a definite twinkle in his eye and somewhat of a smile. The device hanging around my neck is what is called a whisper device. There is an ear plug for me and the guide has a small headphone microphone. As we walked around, he not only kept track of the group, he could tell us something about the site we were seeing and directing us around. I likened his job to that of herding cats. Subsequent kings have augmented the complex, creating the magnificent compound we saw on the tour. Though it is no longer the residence of the monarch, the Grand Palace still hosts several official functions for the king throughout the year. It was here that we saw the elaborate Temple of the Emerald Buddha, with its venerated 31-inch high statue carved from a single piece of jade. Pictures were not allowed. The next morning we took a motor coach tour of the city and saw Bangkok completely and especially the fully developed downtown. While you cannot see the traffic, in places it was bumper to bumper. What was amazing is that we never heard anyone honking a horn. Traffic just inched along and people let other people in and out of the stream. No anger and no road rage. We saw the same thing when we visited Japan several years ago. The architecture of this building was really unusual. After lunch on our own we toured the biggest market I have ever been to. There was everything and anything you would need to buy for daily living. The following pictures show what we saw. Here are all the spices from mild to really hot, the red ones. Tilapia is a common fish thought the region. That evening we had our farewell dinner for everyone on the tour at an outstanding restaurant. Again, the food was not hot, just slightly spicy. It was like we were part of the evening’s entertainment. Pay not attention to the glasses on the table. Pam and fellow tourist on her right. Click on my book and buy from Amazon for an entertaining read. Laos, officially named the Lao People’s Democratic Republic, is a mountainous and landlocked country in Southeast Asia. The country shares borders with Vietnam, Cambodia, Thailand, Myanmar, and China. Laos was once a part of the kingdom of Lan Xan Hom Khao (the Kingdom of a Million Elephants Under the White Parasol), which for four centuries stood as one of the largest kingdoms in Southeast Asia. This kingdom split into three factions before being reunited in 1893 under a French protectorate, officially making the three regions the country of Laos. The country struggled for independence during and after the Second World War, finally achieving autonomy in 1949. Four years later, Laos became independent with a constitutional monarchy under Sisavang Vong, only to be plunged into a long civil war resulting in the Communist Pathet Lao movement (backed by the Soviet Union) coming to power in 1975. The same year King Savang Vatthana abdicated his power and was arrested. The Lao People’s Democratic Republic with the help of the Lao People’s Revolutionary Party – became the only legal political party. During this time Kaysone Phomvihane became Prime Minister and the United States was involved in resettling some 250,000 refugees from Laos into non-Communist countries around the world. Laos today is one of the world’s few remaining Communist countries, though its borders are more open than ever and tourism is the nation’s fastest growing industry. We flew out of Cambodia in a jet-prop driven airplane to Luang Prabang, Laos and arrived just as darkness was beginning to fall. The trip in was uneventful, but the landing into the airport made my eyes get big as the plane flew over the airport and turned up a valley surrounded by mountains into the airport. Clearing customs and immigration was quick and easy as our papers were verified, visas issued, and we were on the way to the hotel. Our introduction to Laos began very early with a time-honored tradition of the “tuk-bat” where hundreds of saffron-robed monks collect alms from their fellow Buddhists. Residences of the city providing food for the monks. The monks silently walk the streets of Luang Prabang and receive helpings of locally made sticky rice from townspeople. It is a symbiotic relationship; the monks are sustained by the food, while the local residents receive spiritual redemption. Fish was a major part of the diet. Also identified were bats and rats. A mixture of spices. Start at the bottom in the center and go up the picture to the top where it gets very red. At the bottom is hot, then hotter, then hottest, and the top one is Cowabunga! If you have to ask, don’t try it. It was early morning and was cool. We wondered about keeping meat cool as the day moved on. The market had only been opened a short period and we got there before the locals. After touring the market it was back to our hotel for breakfast. Then we set out to explore this ancient royal city nestled between the mountains and the Mekong River. The picture does not do justice to the beauty of the temple entrance. Pictures were not allowed in this temple. This is called a Stupa. For centuries the best architects in the land have focused their attention on Buddhist temples. The results are most impressive in Luang Prabang where a plethora of styles and types await the interested traveler. However, it’s not only in temples that Laos has its own peculiar architectural traditions. The Stupas found in Laos are different from those found anywhere else in the Buddhist world. Stupas are essentially monuments built on top of a reliquary which itself was built to hold a relic of the Buddha – commonly a hair or fragment of bone. Laos has its own unique style of Stupa combining hard edges and comely curves. Luang Prabang’s best-known monastery is centered on a 1560 sǐm (ordination hall). Its roofs sweep low to the ground and there’s a stunning ‘tree of life’ mosaic set on its western exterior wall. The walking tour of the old city where we toured the beautiful 16th century Wat Xieng Temple Complex was topped off with a tour of the National Museum. This was formerly the royal palace, housing the personal collection of the last Laotian royal family. Pictures were not allowed. Before dinner, we visited an owner’s house in a village outside of Luang Prabang for a firsthand look at how local residents live. Home of a Luang Prabang villager. Our Vietnamese guide on the left, the villagers in the center and our Laotian guide on the right. Cooking was done outside but covered with a roof. There were 4 places to cook with two more behind these two spots. The lady of the home cooking on a stove and our Laotian guide. We could roam the entire home and take pictures. It was very spartan. The downstairs was a kitchen but the cooking was done all outside in the covered area. They had electricity, a refrigerator, and a TV. Sleeping quarters were upstairs. At first Pam and I felt very awkward, and hung back a little, but the homeowner was so nice and courteous, and while we could not communicate they made us feel right at home. We have noticed civility and courtesy in other Asian countries we have visited. They gave us total run of the house and then rewarded us with some Laotian snacks. We dined that evening in a family restaurant built in the style of the traditional Laotian stilted bamboo house. Next morning it was off to visit a traditional Laotian rice farm. This was absolutely amazing. With all the automation in the world to grow rice, the farmers here are growing and harvesting the crop like they have done for centuries. This is the tractor in Laos when rice farming. The water buffalo is literally part of the family and is highly regarded. This is how you plow the ground to plant the rice plants. One person steers the water buffalo and one person does the plow. Notice that they are wading around in mud and water. People on the tour waded into the muck and tried it out and tried out planting in the muck. Pam and I checked out on that as we could see ourselves falling over into the muddy morass. The rice farm central house and where all the action took place. Notice the rice patches growing in the plots of ground. Pam and I stayed high and dry at the farm. This is what you get. This is sticky rice cooking and is one of the main dishes of Laos. After all that, we were off to lunch. I have no idea what I ate, but it was outstanding and went down very well with a bottle of Laotian beer. I have no idea what we were eating, but it was very tasty. We then visited a water buffalo dairy farm. We toured the farm and had the opportunity to milk the buffalo. We sampled some of the products made from the milk and the ice cream that was made on the farm. Having lived in the Midwest all my life, I found it was unusual not having dairy cows similar to the dairy farms in America. The reason was that the water buffalo is more suitable for the climate which consists of periods of extreme heat and rain. The plant life the water buffalo graze on is not favorable to our dairy cows. This is the difference between animals and climates. Milking the water buffalo. The buffalo does not produce as much milk as our dairy cattle. Pam feeding water buffalo calves. The next morning we left the road behind and took to the river. We boarded a private riverboat for an upstream voyage on this remote stretch of the Mekong River. A traditional wooden river cruiser, the boat’s long, narrow shape allows us to sail leisurely along the Mekong with unobstructed views of the lush banks. Though simply outfitted, the boat offered a bar and dining area, and has more than enough room to spread out. Along the way we made several stops to visit villages of ethnic hill tribes and observe scenes of daily life by the river. One of the first stops was the Ban San H “Whiskey Village.” Laos is famous for its homemade whiskey, and we had the chance to observe the distillation process and enjoy a sample if we chose. I chose. Making whiskey, Laotian style. To me it tasted like very strong sake. I bought a bottle for a friend that considers himself to be a connoisseur of whiskey. The last time I talked to him, he still had his eye sight. Look for the scorpion and the cobra in the bottle. The Laotians told me this was a cure for almost everything, however over indulging may cause a loss of morality. Our boat for the two day trip to Thailand. We stopped to visit the Pak Ou Buddha Caves, which have been home to many thousands of Buddha statues and images since King Setthathirath declared the caves a holy spot in the 16th century. As we sailed along we enjoyed lunch on board the boat. Meats with fish, fruits and vegetables, excellently prepared which put you to sleep afterward. We cruised along the Mekong with the next stop at Ban Bor village. This is a traditional weaving and fishing village where we had the chance to meet local residents. Scenes traveling up the river. More River scenes. We shot hundreds of these. Approaching the village. There was a steep climb up the bank of the river and then up the side of the mountain. Main street in the village. We cruised on to Pakbeng, where we disembarked and checked into the riverside lodge in time for dinner. The lodge has modern amenities, but no air-conditioning. It was not hot but rather cool and muggy. Otherwise the room was clean, neat, and comfortable for the night. Perched on the side of the mountain, we had a beautiful view of the river below. Looking out our balcony of the lodge with the Mekong River below. Sunset from the balcony of our lodge with the Mekong River below. Back on board the riverboat, we cruised through more wild and diverse scenery, with mountain views framing the Mekong. One of the highlights of the morning were the elephants coming down to the Mekong to drink and bath. This was a surprise and everyone got to the side of the boat to get photos. More were coming behind these two. Fishing nets along the Mekong. Laotian women panning for gold on the Mekong. Kids along the Mekong. Kids are kids wherever you go. We wondered if their parents knew what those boys were up to. Entering Thailand and the boat check at the entrance to the infamous Golden Triangle. After crossing the border into Thailand, we cleared customs and immigration. We then transferred to our hotel in Chiang Rai, where we enjoyed an outstanding meal of Thailand food. The two day trip up the river was one of the most exciting adventures we had ever done. We shot several hundred pictures on the river, and have shown only a few here. Check out my website at www.outdoorswithhank.com for excellent bargains from leading outdoor suppliers. Plus click on the book on the front page and buy my book for great entertainment. After Vietnam we moved on to our second country, Cambodia. We flew into Siem Reap. This was an adventure at immigration and customs as there was a shortage of workers and an abundance of tourists. It took over an hour to get through immigration to purchase our visas and then through customs was another thirty minutes. We studied up on Cambodia as we knew little about the country other than during the Vietnam war incursions were made into the country. Though few Cambodians are famous within the United States, one in particular is infamous: Pol Pot, leader of the Khmer Rouge and instigator of the notorious Killing Fields of Choeung Ed in Phnom Penh. In ancient times Cambodia was the seat of the Khmer Empire which also ruled Vietnam, Laos and Thailand. Like Vietnam, the French virtually took over Cambodia in the late 19th century and ruled by proxy until 1941 when they placed Prince Sihanouk on the throne. Tumultuous times took place after 1941 until the 1980s when the United Nations administered elections, reinstated the nation’s king in 1993. Though the country has significant problems, including substantial poverty and an overwhelmingly corrupt political system, many hope the nation will overcome its recent past and turn its attention to a democratic future. Our first day began with a visit to the 12th century temple of Ta Prohm, a mystical decaying Buddhist shrine. One of the area’s most visited temples, Ta Prohm’s ruins have not been touched. They stand exactly as they were when first discovered with massive tree roots strangling parts of the stone facades. Tree Root growing over and around the temple. Musicians at work entertaining the tourists. Notice the artificial limbs. This was common in Cambodia. Bayon Temple with four serene faces. The tree roots have weaved their way through the intricate carvings and hold the temple upright. Removing the trees would allow the temples to collapse. Then we went for a very interesting ride. All over S.E.Asia rather than a taxi, you ride a Tuk Tuk. This is a motor scooter pulling a single seat wagon for two people. We have ridden in taxi cabs all over the world, and this is the most exciting ride we have ever had. You want to kiss the ground when you arrive at your destination. Tuk Tuk to the temple. After lunch we prowled the city streets checked out the businesses and had a foot massage. This was an outstanding experience. I had forgotten one of my nightly medications but this was no problem. We merely went to a Pharmacy and a very nice lady who spoke English, took care of me. I told her want I needed and she sold it to me without a prescription. What a wonderful country. Later in the afternoon we went to Angkor Wat. This is a UNESCO World Heritage site and one of the three great Buddhist sites of the eastern world. Angkor Wat was rumored to be a lost city before its discovery by French explorer Henri Moughot in the mid-19th century. It was a living city until 1431, when the Thais forced the Khmer court to move southeast. Today the site contains magnificent temples and statuary from the Angkorian Empire which in its heyday rivaled those of Greece and Egypt. It took more than 500,000 artisans, workers, and slaves some 37 years to complete and comprises five towers each reaching more than 180 feet. Serenaded by the sounds of the jungle, we entered Angkor Wat Temple, the world’s largest religious building. It was really fascinating as we saw the intricate detail of the bas reliefs and artwork depicting mythological battles and scenes of everyday life. As with all the temples, people were encouraged not to leave the group and wander off the trails due to the possibility of unexploded mines and ordinance. The king surrounded by his followers. Hard to see, but the king is riding an elephant. It was hard for us to make out standing up close. Intricate carvings were everywhere telling a story. We left Angkor Wat and headed back to the hotel. Dinner was on our own. Everyone was so tired we just ate at the hotel and folded our tents. The tour was moving all the time and we needed some rest. After traveling through the countryside we arrived in the afternoon for a visit to the tiny Banteay Srei temple. It was built for the Hindu god Shiva in the 10th century and had exceptional carvings in its red sandstone walls. Banteay Srei’s artistry on a miniature scale distinguishes it from other Angkorian temples, and has earned it the nickname “the jewel of Khmer art.” Its name literally translates as either citadel of women or citadel of beauty. The smallest of the temples, this was our favorite because of the intricate carvings and relief presented all through the structure. On the way back we stopped at a traditional Cambodian village and walked around freely. Some of the ladies were selling some delicacies of sugar cane candy. It was not only good, it was great and very sweet. We will take this over chocolate any day. Preparing and selling the sugar cane candy, outstanding. Small temple dedicated to Buddha. Cambodians are very courteous and civil people. The next morning late, we visited Les Artisans D Angkor, a development project where young adults are taught the traditional crafting methods of the region, including stone carving, woodworking, and lacquer application. We also visited the home studio of Cambodian artist Lim Muy Theam set among lush tropical gardens containing a private collection of art and sculptures. She would look good in my back yard. The gold leaf make these great looking works of art. We transferred to the airport and arrived late into Luang Prabang Laos. There were 5 souls on the motor scooter in the second photo. A friend asked me one time, “How do you get to do all that big game hunting with no complaints?” The answer is simple. My wife enjoys traveling and likes to go to far away exotic places. I like to go too. Time is taking its toll on us and we want to get in as many trips as possible before it is too late. A travel company we have used several times had a guided trip to S.E. Asia that lasted 21 days and visited four countries. Vietnam, Cambodia, Laos and Thailand were on the agenda. We signed up and left January 30th just before all the severe cold hit our area. Vietnam was the first stop. The lobby at the Melia Hanoi in Hanoi Vietnam. We arrived late afternoon in Hanoi after 30+ hours of travel including layovers. Exhausted, we grabbed a quick bite at our hotel and went to bed. The next morning we embarked on an orientation tour of this French-accented city with broad tree-lined streets and colonial architecture. The streets were not clogged with automobiles. Everyone rides a motor scooter and there are thousands upon thousands. It is the way the common man and woman gets around the country. Automobiles are for the rich and these are the people that make up the government. We visited first the resting place of Ho Chi Minh and entered into a secured area. Pictures were not allowed at the front of the tomb or inside. The body was encased in glass and preserved like that of Lenin in Moscow. Guarded by four guards we walked through and then outside into gardens in the area. Looking down the road leading up to the tomb. Security was tight to enter the tomb area. The exit side of the tomb and we were allowed to take pictures at this location. The surrounding areas were an immense garden carefully and beautifully groomed. Ho Chi Minh’s home, automobiles, and other structures were nestled among the beautiful gardens. The tour continued and we passed Hoan Kiem Lake in the heart of the city, where legend has it that a deity rose from the lake in the 1400s and reclaimed the magic sword of Emperor LeThaiTo, which he had used to drive the Chinese from Vietnam. A memorial is erected on the shore of the lake to Senator John McCain for the work he did in helping open up trade with Vietnam. Next stop was the Temple of Literature, founded in 1070 and dedicated to Confucius, which later became Vietnam’s first university and today remains an active place of worship. Pam and I in the temple. Lunch was on our own, and recommendations were made by our guide. Pam and I found a pastry shop overlooking the street and square where a Catholic Church stood. On the third floor we could look down on the populace and all the activity in the market. There are very few cars in Hanoi. The primary method of transportation is the motor scooter and they are thick on the streets with no traffic control of any kind. People just manage themselves with no road rage at all. Lunch in Hanoi and they took American dollars. Our next stop was the Hoa Lo Prison, also known as the “Hanoi Hilton.” The prison was established over 100 years ago by the French and was infamous for torture of the local population. Throughout the Vietnam War, and for many years thereafter, the North Vietnamese Army controlled the prison and held American soldiers captive in order to torture and interrogate them. Only 25% of the original prison is still standing. Inside the walls of the prison. The top of the wall are pieces of glass. Picture of the prison before 75% of it was torn down. This wrapped up the first day in Hanoi, Vietnam. Still suffering from the travel time, we flopped into bed as there was an early trip planned the next morning. We departed early the next morning by coach to Ha Long Bay (Bay of the Descending Dragon). We made a stop first at a business that farms oysters and harvests the pearls. The oysters are processed and sold as food. The pearls are then graded and set into jewelry. The farm operates an outstanding jewelry store specializing in of course pearls. Oyster farm in the ocean along the coast. Harvested pearl which needs to be graded. I did not ask the prices, but the store was full of jewelry with pearls. The ladies on the trip really enjoyed the store. Ha Long Bay is Vietnam’s legendary and beautiful waterway sprinkled with some 3000 islands and islets, and surrounded by a fairytale landscape of limestone cliffs, secret grottoes and hidden caves. A UNESCO World Heritage site, Ha Long Bay was the home of ancient cultures dating back 25,000 years. Our tour here included a ride on the placid waters aboard a traditional “junk” and a lunch on board of local seafood specialties. After touring we checked into our hotel overlooking the bay and enjoyed another outstanding Vietnamese dinner. The islands and harbor outside our hotel window. We flew this morning to Vietnam’s third largest city, Da Nang, situated at the mouth of the Han River on the country’s south central coast. Upon arrival in Da Nang, we enjoyed a lunch at a local restaurant, then checked into our riverfront hotel in Hoi An. Hoi An was originally the commercial capital of the Cham people before seeing a succession of Dutch, Chinese, Portuguese, and Japanese traders all contribute to the building of the colorful old town which is now a UNESCO World Heritage site. These days the streets belong to pedestrians and bicyclists as no cars are allowed in the old town. Covered Bridge in the old town. Monkey Shrine in old town. Typical Vietnamese luncheon. On the lower right hand corner is Pam’s sunglasses she has been looking for since we got back. We visited a local Vietnamese village nestled amidst endless rice paddies. Here we gained a special insight into the every day life of a local farming community as we walked through the village past modest homes and gardens of vegetables and fruit. Local organic vegetable farm. Homes in the background. The people raise a lot of vegetables besides rice. We continued on our tour and headed to the airport for our 1.5 hour flight to Siem Reap in Cambodia. On the way we stopped at the beaches of Da Nang. This was a recreation spot for our soldiers during the war. Our guide said that the veterans that visited could not believe how much it had changed since the beach was now lined with upscale hotels. Pam and I at the Dragon bridge on the beach at Da Nang. Pam on the beach at Da Nang. This was the end of the day and it was time to head to the airport and fly to Cambodia. Our Vietnam visit was over and everyone in the group was worn out. Next was getting through the customs and immigration in Cambodia. Check out the front page and buy my book. It makes a great gift and a good read. After all the planning, preparation for going on a big game hunt, and proudly bringing home our prize to the wife, neighbors, and other people, feasting is what it is all about. Field dressing the animal, and aging and marinating are important factors in great dining of the game. Wild game, the perfect food. I am firmly convinced cooking of big game well done is one of the most violated errors that is responsible for ruined meat and that of dissatisfied diners. Big game meats, especially steaks, roasts and loins are best when cooked rare to medium rare. Cleanliness and sanitary handling are key elements to successful cooking and dining. There is the fear of bacteria but deer and elk are not known as trichinosis carriers. Cooking meats to a surface temperature of 160 degrees will prevent bacteria penetration as the meat is seared. Careful washing of hands and utensils is an excellent precaution. We have several friends that we dine with when we have roasts or steaks. Low and slow are the two ways we like to cook the meat. One of the major preparations we use is marinades. We marinate all of the steaks and the roasts. I have read that if the animal is properly aged, a marinade is not necessary to make it tender. The moose we just brought back from Alberta was hung for 24 hours. Then it was butchered, packaged, and sharp frozen to -40 degrees centigrade. We picked it up the next day. The last two elk harvested were hung for 24 hours and then packaged and sharp frozen. In the case of the moose, it would be highly unlikely for us to stay in Alberta for 10 to 14 days just to age the moose. I have yet to age an animal that I have harvested. In the neighborhood I live, the neighbors would find it somewhat unseemly to hang a deer or an elk from a tree in my front yard. Marinades not only flavor, but help tenderize the meat. Anywhere from a few hours to several days for big cuts will do the job. We also use a device that pokes holes into the meat. That helps to get the fluid to penetrate the meat better. We also soak the meat with the marinade in the refrigerator. On some steaks we use a meat hammer to pound the daylights out of it. This should be a thick piece of meat and should be flattened out somewhat. Since game is a very dense meat, this helps break down the fibrous tissue. Acetic acid liquids make the best way to help tenderize the meat. Vinegar, citrus juices, your favorite red alcoholic fruit of the vine, and yellow liquids that come out of pop top cans make great bases. For spices, we use lots of garlic, pepper, soy sauce, onions, bay leaf, dry onion soup mix and commercial steak seasonings. The cook at the lodge used Montreal Steak Spice, a commercial product, and it really added a nice flavor to the meats. If you don’t have the time, use a really spicy Italian salad dressing mix and doctor it up if you feel the need. We use olive oil in many instances with our marinades. Oil will carry the flavors of seasonings and protect the meat from burning when grilling. Sautéed onions, garlic and other herbs will enhance their flavors. We will cook roasts all day in a crock pot in a seasoned broth. We also use cooking bags and roast for a long period of time at low temperatures to achieve tenderness. With steaks we broil, grill, or bake them at 350 for about 25 to 20 min. This is after we have soaked it in a favorite marinade over night. Marinate meat 12 – 24 hours turning whenever. We also use this on steak. Put in freezer bag, seal, and soak overnight in a refrigerator. Marinate meat for 24 hours. We use this on roasts or steaks and for all four legged game animals with hooves. After mixing the ingredients, place steak in large resealable plastic bag or glass dish. Refrigerate for 6 to 8 hours. We use this as a soak for roasts and a marinade for steaks. With roasts we use a meat thermometer. With steaks we like to bake them depending on the thickness 15 to 20 min at 350 F.
We use these recipes for a lot of roasts as they are easy. Put it in the crock pot and leave it all day. We have used this on Caribou, Elk, Deer, Buffalo, and Moose. 1 (12 oz) can of your favorite yellow alcoholic liquid that comes in pop top cans. Cover and cook on low setting for 8 – 10 hours. (Optional) Shred the cooked game by pulling it apart with forks and use French rolls or sandwich buns for great sandwiches. Use meat thermometer Rare = 130-135 F, Medium Rare = 135-140 F, Medium = 140-145 F.
Baking the roast beyond 145 will cause the roast to be a little dry or tough. Eat well my friends. Wild game is nature’s perfect food and a gift from God for those of us who venture into the wilderness, spend great sums of money on gear, trips, licenses, and tips. When we sit down and enjoy a great meal of wild game, thanks is given for the opportunity in this country to hunt great and small beasts and enjoy the bounty that we have been given. Click on the link and buy my book from Lulu, or go to the website and click on the book and buy from Amazon. We drove across Montana on Highway 2 to avoid the mountains to the south and west of us. This was all farm and ranch land with two lane driving and was just a little boring. Montana is a beautiful state outside of the mountains with the prairies, farm and crop lands. At Shelby Montana, we picked up I-15 and drove straight north to the Sweetgrass/Coutts port of entry to Canada and exit from the U.S. This sculpture was just outside of Gladstone, ND. We drove up to a Kiosk, presented our passports, and answered questions about why we were entering Canada. We were told where to park and took our paperwork inside. The person at the kiosk was courteous, but quick and to the point. The form for declaring the firearm is available on line and also Mike’s Outfitting sent me a copy to complete. DO NOT SIGN THE FORM. I didn’t. You will sign it in front of the immigration officer. I also took in a copy of my contract and copies of the correspondence taken place with Mike’s Outfitting. I was questioned as to whether I had other firearms in my possession. The answer was NO. Mike had also cautioned me NOT to bring a hand gun with me. They signed the form, took my $35.00, gave us back our passports and we were off on our way. My advice just to save a little money is to fill up your tank before you get into Canada. They sell gas by the liter and it take 4 liters to make a gallon. The price of fuel when we crossed the border went up drastically. We are so used to driving the interstate system in the states that we assumed we would have an easy time filling the tank. NOT SO. There are no signs along the highway advertising gasoline stations. There are some rest areas, but they are very far apart. My truck holds 36 gallons, so when we got to the halfway point we filled up regardless of where we were and it also gave us a potty break. In larger cities they do have a section of the highway that advertises gasoline stations available. We always filled up even if we had 3/4 of a tank still available. Use a credit card wherever you go if possible. You may get a charge when you get home for the use of the card, but that is minimal. The dollar was worth 26 cents more that the Canadian dollar. Our card makes that calculation for us and we get charged the correct exchange amount. We used US dollars a couple of times and no one would make the exchange and considered it straight across the board. Canada is on the metric system and the highway signs are in Kilometers. That is easy to figure as a 1 mph is equal to 0.621 Km. So when you see the highway speed sign saying 110 Km, multiply by 0.621 or 0.6 to get the speed in miles per hour. We hardly ever noticed the Canadians driving the speed limit. They flew by us and we never passed a car on the way up or back. I drove the speed limit because we were in a foreign country and I wanted to follow their rules. We never saw one highway patrol on the entire trip in Canada. Maybe that is why they all speed. We came back home the same way we went up. The thought was to go south in Montana down through the mountain regions, into Wyoming and the across South Dakota. When we saw there was snow forecasted in the mountain areas of Montana and Wyoming, we stayed on the previous route. Sweetgrass/Coutts is the busiest border crossing in Canada. We got up extra early and were on the road at 6:30 after the free breakfast at the Comfort Inn. When we got to the border there was a line already, but it moved along fairly briskly. There were a lot of RVs going south for the winter. We saw signs in the towns warning people to start preparing for winter as it was coming soon. Also, we saw RV parking lots everywhere along their highway system and dealers in every major city. People in Alberta must RV a lot and I think there must be a group that heads south for the winter. Pulling up to the kiosk we were met by a very pretty and friendly young lady. Smiling all the time she asked for our passports, and where we had been. “What were you doing up there?” she said. I said, “Hunting moose.” “Where is the moose?” she asked. I pointed to the coolers in the back of the truck and said, “He is in the coolers.” That brought laughter and she motioned for me to park the truck, leave the gun and the moose in the truck along with my wife and go inside. Someone will call your name. That step was easy. Inside, I sat down and waited. Other people were called and some had come in after me. This was beginning to feel like I was going to be questioned or maybe shaken down. My guide had prepared the skull cap for the crossing, and indicated they should not want to look at this, but be prepared. Also, I was warned they may want me to open the coolers. Now this is bad as they were packed to the top and all seams had been double taped. The processor said, “Don’t worry about a thing, you are good for more than 5 days, but do not open the coolers. If they are opened, you will have to buy dry ice to make it home.” The guides suggested that I not argue, but ask that they not open the coolers. We were in the middle of nowhere so where would I buy dry ice? Not to worry, we discovered a company called Praxair. They are in 50 countries with 26,000 employees and supply industrial gasses of all kinds. Wherever there is a medical complex or an industrial complex, like oil well drilling and processing, there is Praxair. We then called several spots along the interstate and located who had the dry ice. Problem solved. If they opened up the coolers, our overnight stop was Dickinson, ND and Praxair was expecting us if we needed them. They did not open the coolers and they did not inspect my horns. Whew!!!!!!! I presented my hunting license for Alberta, my application to bring a gun into Canada, my receipt from the processor, a processed game tag from the processor, and my contract with Mike’s Outfitting. They had our passports. Then a form was completed from the U.S. Fish and Wildlife. The officer stood right there and helped me fill it out. Then another form was completed by immigration and again the officer stood right there and helped me out. Then another person came over and they both discussed my document to bring a gun into Canada. It was not stamped. The people in Canada did not stamp it and they just said they had seen this before and if we come back up to hunt, ask the officials to stamp the form. The officer in Canada was really friendly and discussed the location where I was going to hunt moose, and gave us a big thumbs up on that area. We discussed processing too. They were very helpful. Then it hit me. I was asked to complete a form that Homeland Security wanted regarding my rifle. I was told it was optional, but if I ever hunted Canada again, it would help me get across the border. I wrote a description of the gun, just like the description on the form to enter Canada. Listed the serial number, and the officer said now I need to see the gun. When I came out of the door with the officer in his gear and carrying a sidearm, my wife’s eyes doubled in size. I pulled out the gun, he inspected it and verified the serial number, signed it and back in we went. I was given a copy and told to keep the document with the gun, if I hunt overseas or come back to Canada. It will make crossing the border easier. They gave us back our passports and we were off to fill up the tank with cheaper American gas and head for home via Dickinson, ND, then to Council Bluffs. Total time from when we got to the border from when we left was 90 minutes, and we did not have to open the coolers. Everyone was courteous and helpful. Buy my book and enjoy hunting adventures, or go to the website at outdoorswithhank.com and buy from Amazon. The moose was at the processor and we could not pick him up for two days. With nothing else to do and everyone in the camp having got their moose, we decided to go touring for a day. Alberta is rich in history and great places to visit, but we were up north and west so they suggested we visit Dawson Creek, British Columbia, just a couple of hour drive north of the lodge. On our drive up to and from Dawson Creek the highway was peppered with these signs warning of moose crossings. We did not see any signs warning of deer crossings. This was a really nice drive with lots of scenery. To the west we could see the mountains in British Columbia with the snow covered peaks. It was a beautiful drive. Dawson Creek derives its name from the creek of the same name that runs through the community. The creek was named after George Mercer Dawson by a member of his land survey team when they passed through the area in August 1879. Once a small farming community, Dawson Creek became a regional center after the western terminus of the Northern Alberta Railways was extended there in 1932. The community grew rapidly in 1942 as the US Army used the rail terminus as a transshipment point during construction of the Alaska Highway. In the 1950s, the city was connected to the interior of British Columbia via a highway and railway through the Rocky Mountains. Since the 1960s, growth has slowed. Dawson Creek is located in the dry and windy prairie land of the Peace River Country. As the seat of the Peace River Regional District and a service center for the rural areas south of the Peace River, the city has been called the “Capital of the Peace”. It is also known as the “Mile 0 City”, referring to its location at the southern end of the Alaska Highway. It also has a heritage interpretation village, an art gallery, and a museum. Annual events include a fall fair and rodeo. The community that was formed by the creek was one of many farming communities established by European-Canadian settlers moving west through the Peace River Country. When the Canadian government began issuing homestead grants to settlers in 1912, the pace of migration increased. With the opening of a few stores and hotels in 1919 and the incorporation of the Dawson Creek Co-operative Union on May 28, 1921, Dawson Creek became a dominant business center in the area. After much speculation by land owners and investors, the Northern Alberta Railways built its western terminus 3 km (2 mi) from Dawson Creek.The golden spike was driven on December 29, 1930, and the first passenger train arrived on January 15, 1931. The arrival of the railway and the construction of grain elevators attracted more settlers and business to the settlement. The need to provide services for the rapidly growing community led Dawson Creek to incorporate as a village in May 1936. A small wave of refugees from the Sudetenland settled in the area in 1939 as World War II was beginning.The community exceeded 500 people in 1941. Upon entering the war, the United States decided to build a transportation corridor to connect the US mainland to Alaska. In 1942, thousands of US Army personnel, engineers, and contractors poured into the city – the terminal of rail transport – to construct the Alaska Highway. The highway was completed in less than a year; even after the workers involved in its construction departed, population and economic growth continued. In February 1943, a major fire and explosion in a livery barn, packed with road-building supplies including dynamite, caused serious damage to the center of town; five people were killed and 150 injured. Dawson Creek became a station during WWII in September 1944. The station disbanded in March 1946. By 1951, Dawson Creek had more than 3,500 residents. In 1952, the John Hart Highway linked the town to the rest of the British Columbia Interior and Lower Mainland through the Rocky Mountains; a new southbound route, known locally as Tupper Highway, made the town a crossroads with neighboring Alberta. The next year, western Canada’s largest propane gas plant was built and federal government offices were established in town. In 1958, the extension of the Pacific Great Eastern Railway to the Peace from Prince George was completed, and the village was re-incorporated as a city. Between 1951 and 1961, the population of Dawson Creek more than tripled. The RCAF center reemerged on October 1, 1956 and was declared functional in 1958. It was disbanded a final time in March 1964. The statue is a tribute to George Mercer Dawson who in 1879 lead a survey through the area and for whom the town is named. Right in the center of town is a monument to the beginning of mile “0” of the Alaska Highway. The Alaska Highway house is a fixture in the community. We enjoyed our stay and walked around all the historic sites in the city. A community of 12,500 residents, it was bustling and after a great lunch, we headed back to the lodge. At the lodge we had another great meal as if we needed it, said our goodbyes and drove back to Spirit River for our last night in the 49 Motel. Next morning it was off to the village of Hines Creek, Alberta. With a population of 396 most of the people are employed in the forestry or oil business. The Hines Creek General store is a jewel on the prairie. Besides processing game for the hunters, cattle and hogs for the area, groceries for the surrounding area, the company ships beef sticks and jerky all over western Canada and specialty products on demand. The 585 pounds of meat was packed into 4 coolers to the top. It was packed as tight as we could get it. the lids were then sealed tight with duct tape all around the seams. The meat had been sharp frozen to -40 degrees. We were told not to worry about dry ice and with the sealing of the coolers and the temp to which the meat was frozen we would have no trouble. We didn’t and after a three day trip home the meat was as hard as when we put it in the coolers. Read the next blog as it will tell you all about going through the border into the U.S. and driving in Canada. For a good entertaining quick read buy my book. It makes a great gift, or go to the website at outdoorswithhank.com and buy from Amazon. Do you ever get up in the morning and say to yourself? “This is going to be my day in the sun.” Well, driving up to the lodge that is how I felt, and Pam told me to slow down more than once as I was exceeding the speed limit. When she is confident and upbeat, that is a good sign. After 51 years of marriage, I think we read each other pretty well. Decades ago, before I got married, a friend told me, “In your marriage be either right or happy.” I chose “happy” and things have worked out well for both of us. Sunrise in Alberta and it looks like it will be a high overcast day. The great beast will not be so tied to the stands of timber and may wander outside of his protective cover, or maybe, he will move closer to the edge. When we arrived ready for another large breakfast, the other two guides said, “You now have the best of all of us. There will be six sets of eyes out looking for you and this is your day.” How much confidence can a person build up. Everyone around me is saying today is your day. That owl is one of many different types of mounts in the lodge. The problem I have with him is I feel like he is staring at me. He can’t be because he is dead. I find myself looking out of the corner of my eyes to see where he is staring next. We started out before daylight and searched along the road and stands of timber. As usual, we were seeing our fair share of cows. Alberta does not have a cow season, although they do have a week calf season. We were shocked, but found out that the kill rate for calves is 80% That is horrible. The predator is the Canadian Grey Wolf, and I carried a tag for wolves if I saw one or several. Besides game, they slaughter cattle. The farmers will let you hunt them anytime. We can visit more about that later. This calf was spotted as we slowly drove down the road. The cow was back further in the timber, but we expected to see a bull or at least spook one out. The calf never spooked. It just kept grazing away and slowly fed its way back to where the cow was. We were only 30 yards from this animal. The guide thought that this road was used mostly by the oil companies and they were here only periodically. Very low traffic should have made this a good place for Bullwinkle. The other two guides were looking in different areas, but were only seeing cows. In the three days we had hunted, all of us combined had seen over 250 cows. That is good for the population in the future, providing the Canadian grey wolves can be dealt with. This is what the oil patch country looks like. We have total and complete access to all the ground. We never saw a single animal. The enthusiasm that I had in the morning was starting to wane. Pamela said she could see it in my face as I felt a pat on the right shoulder. One of the guides called and said they had spotted a spike bull if I wanted to nail it. I did not want a spike bull, but said, “Let’s take our time and hunt our way over to the spot and take a look.” I did not say I would kill it, only take a look. Right at that time I felt lower than whale poop. That is the lowest thing in the ocean. The guide then spoke up and said, “Look we have three more days to hunt, and with all these cows, there is a decent bull out there waiting for your bullet.” With all these cows, the bulls do not even have to fight each other to get one, or more. We drove through a gate and onto a farm of canola and the guide hit the brakes. All he said was, “Big bull, let’s go.” We quickly got out of the truck and shut the doors gently. Not 100 yards from us a cow and calf spooked. I still had not seen the bull. The sky was overcast and the beast was black against a dark background. We went about 25 yards and the guide said, “Right now, hit him.” I could not find him and finally got him with the scope. I was told to take my time, but I felt like I was being rushed. He was hard as heck to spot although I could make out the horns so I worked back along the body line. I asked, “How far?” and was shocked at the two words he said, “400 yards.” I have never ever shot that far and was really nervous. I tightened myself up, stopped breathing, making sure my left hand was holding down the gun in the shooting stick tripod, adjusted for the drop per the scope and sent the first round on its way. Immediately, I cycled the gun putting a fresh round in the pipe and sent it to the great beast. After reloading the magazine and putting a fresh round in the chamber, he went down. We walked toward him, and lo and behold he got up! The guide said over and over again, “Hit him! Hit him!” and I gave him another two rounds. We were about 300 yards at this time and maybe a little closer, but as we started walking toward him he stayed down. The concern was he would take off and we would have a wounded animal to track down. No one is interested in doing that. When I got up to him his head was down, but he was still laboriously breathing, so I put another shot into his chest right behind his left front leg at point blank range. One breath, and that was the end. It was a cool day, but I had sweat running down my face. My furthermost shot up until now was a buffalo in January in South Dakota. That was 300 yards, but the animal was brown against a background of snow. This was totally different, plus the distance made me really nervous. I mentioned earlier about the Canadian Grey Wolves. They are a menace and the ranchers want them shot by the hunters. The wolf is the smartest of the predators. Mike’s Outfitting is offering this fall wolf hunting at a really reduced price. One of his guides is an expert in killing these beasts and I am looking at going up next year for a wolf hunt. The wolves kill moose, elk, deer, and cattle and there is a bounty on them. The other two guides hearing the shots, showed up and the process began of taking some pictures and loading him into the back of the pickup. They had an electric winch on the bed of the truck and winched him right up a ramp. Then drove the 4 wheeler on top of the moose. Wow, these people had it all down to art and he was loaded up and taken back to the lodge. His body is really black and notice the white legs. 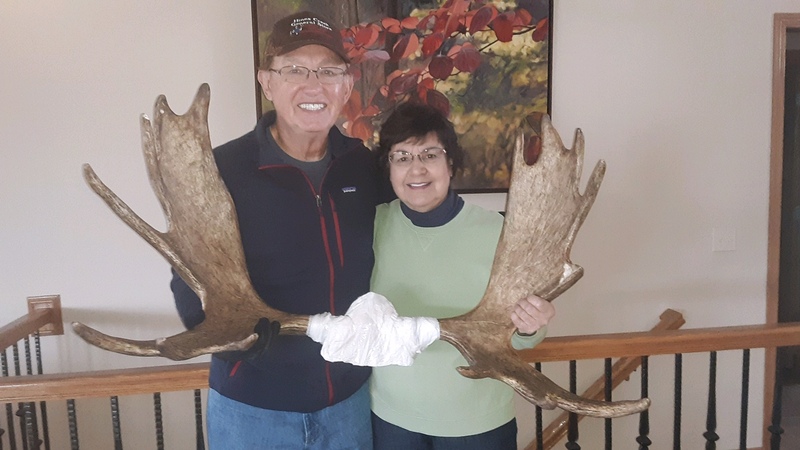 Pam and I with the moose. Our guide Kyle, with Pam and myself. This is how they get the moose out of the field and onto the truck. An electric winch and cable are secured around the horns and he is hoisted aboard. The 4 Wheeler is driven right up on top and the ramps laid along the side of the bed. That is Whiskey our guide’s dog. He is patiently waiting for a leg bone which after each moose is brought to him to enjoy. At home with the horns. The meat is in our freezers and we ended up with 585 pounds of moose. I did not take pictures of the gutting, but it was really interesting. Pam and I are both healthcare professionals and we were interested in his vitals. The lungs were big, but not any bigger than we had seen on some of the elk that we have harvested. The heart, however, was bigger than a volley ball and we were amazed at the size. Their stomach has four chambers like a cow and they chew their cud. They also consume about 50 to 60 pounds of vegetation a day. They have no upper front teeth. In order for us to take the horns back across the border into the U.S., all spinal cord tissue must be removed along with all brain tissue. The brain is not any bigger than a baseball. They react to stimulus only. They are looking for a place to hide, a place to eat, a place to drink, and during the rut, a place to get intimate with the cow population. Next blog in 2 weeks tells about what we did afterwards in Alberta. Buy my book. It makes good reading for a snowy cold day. To bed last night at 10 p.m. and up at 5 a.m., Pam and I were on the road to the lodge to have breakfast by 5:45 a.m. After yesterday and the day before, I was brimming with confidence and could not wait to get out into the fields of canola, wheat, oats and hay. We torqued down our breakfasts and were the first ones out the door to the truck. Even the guide was amazed at our eagerness. He expected us older people not to move that fast. This picture was taken the previous night as we were heading back to the lodge. Moon rise over Alberta and we just stopped and looked at it for a while as the earth turned and it came up higher in the sky. The thought was maybe a moose will come out to admire the moon rise too, but to no avail. Down the roads we went. It was just light enough to make out shapes heading toward the tree lines and standing woods packed with timber. We could make out shapes and we saw a half a dozen bull moose heading to the shelter of timber. Several were of really decent size. We also saw, as usual, a lot of cows. Our guide told us that moose hang around a general area unless spooked. At that point they never come back to the same area for some time. Another fact that is interesting is that moose do not like wind and they will really hunker down in windy conditions. It is hard enough to see them without them making themselves more scarce. Mom and calf. This is Pam’s favorite picture and one of mine too. We were about 100 yards off the road when Pam spotted them just standing there and posing for us. She wanted that picture. It is amazing they are so far away from the timber. They must have been moving to another spot and froze for us. The animal is very black and the timber they hide in is very dark to almost black depending where the sun is. Today was partially cloudy with very light breezes. We hoped the big beasts would be out roaming around looking for female company or some very fine canola to feast on. If you are a bull moose in this section of Alberta, you have no problem finding female company. Moving down the roads and through the oil patches, we did not see anything initially. Then we came across two really young bulls. The guide classified them as “forkys”, but Pam and I classified them as girlie man bulls. They were really young and would have been a really easy shot. I could have gotten out of the pick up, laid my gun across the hood and punched one of them. They were not 30 yards off the road and standing very still. It was an easy shot, but this was only day two and there was no reason to harvest a bull we really did not want. Pam was worried I was going to take the bigger of the two. Edging down the road and keeping an eye on the stands of timber, we rounded a corner, and there stood a cow and calf not more than 75 yards off the road. Just beyond the cow and calf was a really great looking bull. He was just standing there like he was frozen and we moved down the road where we could get out. Quietly we got out of the truck and did not slam the doors. We were moving down a stand of timber and the cow and calf were on the next stand of timber. There was only about a 30 yard stand of grass between the two stands of timber, and this is where Mr. Bull was standing. (I hope you the reader can visualize or understand what is going on). Mr Bull was in the open. The two cows were on the edge of the next stand of timber. This was a really really nice bull per the guide. We got this picture out of focus, but what is a person to do considering we were driving slowly along the road to a spot out of sight to go and shoot the bull, providing he was still there. We crept along the timber line and I was almost in shooting position when the calf spooked and took off running down the road. The animal was immediately followed by the cow. Mr. Bull (the dirty rat) dove for the timber. I did not say it, but I thought expletive deleted. We were close to the timber and both the guide and I did not believe the cow or the calf saw us. We could have been winded. The three animals ran down the road and crossed to the other side. We turned around and stopped about 100 yards where they had crossed. The guide said, “He is not going to stay with that cow. He will come back across the road and back to the tree line.” He did just that, and stopped just across the road on the edge. THIS WAS A PERFECT SHOT AND NOT MORE THAN 150 YARDS AWAY. Can you hear me? As I type this I am screaming! The first piece of bad news came: 1. He was standing just off the road. That is against the law in Alberta to shoot an animal along the roadway. It would have been my luck to have dropped him, and along would come the constabulary. Who do you think would be going to jail? The American. 2. The lodge did not have permission to hunt this piece of ground, and it took about 10 minutes before the guide contacted the owner. It was okay, but by then that magnificent piece of moose, had moved over to the stand of timber. He has put some distance between us when we finally got the go ahead to shoot him. In the meantime, he moved over to the timber, and we lost sight of him. We attempted to locate him, but we both felt he took off for better and safer areas. With the wind at our back, we never would have caught up to him. There was a lot of activity going on at this time and we are lucky to have got this picture at all. We took off trying to get into a position where we could spot him, but the wind was on our backs, and he just kept moving ahead of us. Finally, after being soaking wet from sweat, I gave up. The guide, God bless him, wanted to keep moving, but I was worn down. Pamela sat in the truck and took a plethora of pictures of everything that happened, and as I typed this blog, she was right there to make sure I did not forget anything. The good news was that the two other hunters each had dropped their moose. One was a really nice boy and the other was a meat moose along the line of the “forkys” or to quote Pamela, “girlie” moose. We did not share that with anyone at the camp. Caught in the act. The bear had pulled open the door to the bin holding oats and was woofing them down to his heart’s delight. Then we came along. It was a small bear and when we came by again later, there he was, chowing down. The evening was uneventful, although we did see, as usual, a lot of cow calf groupings. We were both beat from the day and did not even stay for the soup in the evening, but went right back to the 49 motel. A harvest of a really nice moose came close. Close is only good in horseshoes. That night I slept like a baby and cried all night. Read the next post on January 1st, and always remember to never give up. Click on the Lulu link and buy my book for a good quick and entertaining read. Makes a good gift for someone who has everything, or click on the link on the website and buy from Amazon. It was finally going to happen! After a three day drive from Council Bluffs, we arrived in Grand Prairie, Alberta Canada. Next morning we met the chief guide at our motel and followed him up to Spirit River and to the lodge. We then met the staff and everyone was shown to their rooms except for my wife and I. We were staying at the 49 Motel in Spirit River. The lodge had adequate rooms, but there were only two bathrooms and one shower. Not so good for my wife but Mike told me hunters bring their wives all the time and stay at the motel. It was only 20 minutes from the lodge. The lodge was full of mounts of all kinds from bear to elk to a multitude of mule and whitetail deer. Look at the pile of horn lying in the bottom of the picture. Next was licensing, a really big lunch, and then guidelines on how the hunts would take place. There were five hunters in total and three guides. Pam and I teamed up with the chief guide by ourselves. The other two guides had two hunters a piece. One thing the guides stressed at our initial meeting was to keep shooting as long as the moose was still standing. More than likely it would take several shots. They stressed that these are really big animals and it takes a lot to bring one down. It was also common for one to get up after being shot. We were instructed to shoot again and again until he goes down, stays down, and his head is down. Next we went out to the range in back of the lodge and shot our rifles to make sure they were zeroed in. Then it was off to hunt till it got dark. This is farm country with gently rolling fields of canola, wheat, oats, and hay. It is also oil country and the land is peppered with large swaths of forest land containing a multitude of pump jacks. We were able to hunt this ground, although the roads were dirt and not maintained well. We could hunt the farm ground too and Mike’s Outfitting has obtained permission from a lot of land owners yielding plenty of acreage to hunt. This is pasture ground and the crop fields are scattered throughout the area. Notice the timber at the top of the picture. This is made up of Spruce, Aspen, Poplar and other smaller native woods. When it gets light the moose hide in the swatches of timber. Keep in mind they are black and blend in really well with their surroundings. Our three guides had eyes like that of an eagle and could spot moose in the timber at great distances. All of us hunters complained about the same thing. They were seeing things and we could not see squat. That is the difference between a young man’s eyes and ours. The farm ground had massive fields but they were bordered by stands of timber running for miles and about 15 to 20 yards wide. The timber was a mix of spruce, aspen, poplar, and a tall plant that had a dark look to it. The reason I bring this up is that the stands of timber were almost black looking. The moose we were hunting were black except for their horns and legs. The legs were white. In a 4WD, 4 Door, F250 we prowled the roads examining the stretches of timber and searching for moose. I have never seen such amazing eye sight as our guide had. The other hunters had the same experience with their guides. It was amazing how they could spot game in the timber line. I want to also add that this country had deer roaming all over it and we saw whitetail as well as mule. They also have elk, and offer bear and wolf hunts. This is definitely a one stop shop hunting lodge. Timber was to the left with a harvested Canola field to the right. We studied the tree line and glanced out to the open ground. The main concentration was the tree lines. Notice how thick it is and dark. A perfect place for a moose to hide. On the first day our guide did not see a bull moose, but did see plenty of cows and cows with calves. That is the difference between a young man’s eyes and mine and my wife’s. As it got toward evening, one of the hunters had a 250 yard shot and unfortunately missed. He was disappointed, but he had hunted here before and was looking for a meat moose. It was a respectable animal, but he was not too disappointed as he knew there was a young boy out there for him. That is a calf. The cow was deeper in the timber, and the calf did not even spook. We stopped about 50 feet from her and just watched as she took her time nibbling away at the stand of timber. I could not see the cow, but our guide did and said it was a big mature girl. Now where are the boys? As it got dark, we headed back to the lodge. Our two main meals were breakfast and lunch. Lunch was the big meal for the day. In the evening it was generally a soup or a soup and sandwich combination. There was always home made dessert and was outstanding. After supper my wife and I would head back to the Motel 49 in Spirit River. This was not New York City, and the Motel 49 was not the Waldorf, but it was very clean, comfortable, and met our needs perfectly. We were to be at the lodge by 6:15 for breakfast and then it was off to hunt. The next day we hit the roads at 7 a.m. and in the dim light, we could see big moose heading back to the stands of timber lining the fields. They love the canola fields and this was where we concentrated. We also moved into some of the oil country timber but saw nothing. Our best luck on spotting moose was the stands of timber. We were constantly seeing cows with a calf. That was a good sign as wherever the girls are the boys are soon to follow. It wasn’t long. A father and son team had just harvested two moose. One was a really big boy, and the other was acceptable, but needed some growing. Both hunters were pleased. For them, this meant they would get their game to the processor, wait a day, and go back south to the U.S. Both men were smiling ear to ear as we pulled into the lodge and went to see their results. We got back to the lodge after all the loading, gutting and preparation for the processor. Two guides did all of this and the hunters were really pleased with their harvest. It would take a day to have the processing and freezing done. Then they would go back to New Mexico the following day. After another great big meal and being stuffed, we waited an hour then went back out to prowl the prairies and oil patches. We hunted until late in the day, but did not see a decent bull. There was an opportunity to harvest a young spike, but it was early in the hunt and if I got to the last day, I would take it. Back to the 49 Motel and repeat the same process next day. The story continues on December 15th. Click on the link and buy my book about the hunting trips taken.